What's it about? Paranormal investigator Dr Markray (Richard Johnson) decides the ominous and supposedly haunted Hill House is a perfect place to conduct an experiment and invites the supernaturally-inclined Eleanor (Julie Harris), clairvoyant Theo (Claire Bloom) and sceptical Luke (Russ Tamblyn) to help him. The house is not impressed. Is it any good? A great adaptation of Shirley Jackson's The Haunting of Hill House and the definitive haunted house film. 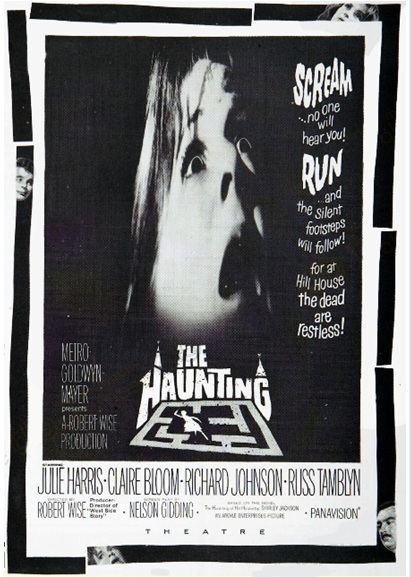 In reviews of The Haunting, it is customary to pay tribute to the fact that not one single ghost is revealed throughout the whole film, the frights generated instead by the power of suggestion and reliance on atmospherics over visceral shocks, something it does with aplomb. But The Haunting delivers more than mere scares. The entire film, and the character of Eleanor in particular, is open to tantalising interpretation. Is the haunting actually a manifestation of Eleanor’s inner demons, as her deep-rooted mental and psycho-sexual neuroses are fuelled by her surroundings and companions? With such intriguing subtext, The Haunting succeeds in stimulating the brain as well as the nerve endings. Unlike the dire 1999 remake, which stimulated nothing but the yawn reflex. Anything else I should know? There may be no CGI or stop-motion, but that's not to say there are no special effects – the technical prowess demonstrated here is very special indeed. Skewed camera angles, staccato editing, inventive use of light and masterful sound design all combine to build up a palpable sense of dread, reaching a peak in the terrifying sequence where the women cling to each other in a bedroom, while some unseen, malevolent force outside bangs and moans its way around the walls, threatening to burst into the room at any moment (check it out in the clip below - fast forward to about 3 minutes in). The house itself is a marvellous creation, an uneasy mix of open spaces and dark shadows, with windows like eyes and distorted, oddly shaped rooms. For external shots, Wise filmed the building in infra-red to give the stonework an unnatural quality, thereby adding to the ghostly effect. The overall result is to make the house itself become the villain of the piece, a feat which few have managed before or since. More on this here. What does the Fonz think? Whose hand was I holding??!! All the way up to 11 on the brown trouser-meter.